The Superstar Fund has its own blog! 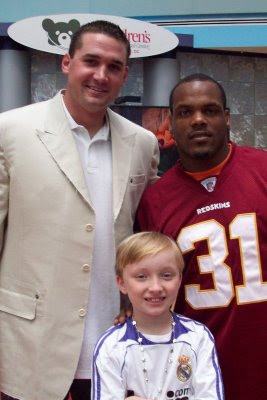 We will keep you all up to date on Mason Leach Superstar Fund activities through a separate blog (this one) that will also be connected with a dedicated Superstar Fund website, coming within a couple days. Our other blog concerning Mason's battle against cancer will remain up and we may post something there once in a while, but it will not be related to the Fund. A big thank you to Jamison Mullen, Billy Glading and Conor Gill for taking the time to come to the hospital and visit with patients in Hematology and Oncology. They were terrific and really connected with many patients. It adds so much to the day to have these athletes share their time with them. Thank you again to Katherine for helping us get these guys there. It was truly special. DC United visited the hospital on June 10. 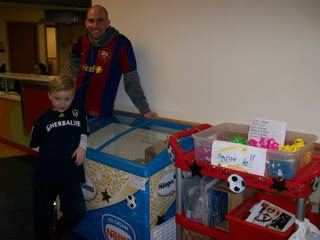 Mason's Fund donated 300 soccer balls for the players to hand out to patients. Kids played soccer in the atrium and soccer balls were all over the hospital. Mateo said he thought the players made the kids really happy. He originally wanted to buy Adidas soccer cleats for all the kids but we told him that might be a little hard. The nurses on Hem-Onc said soccer always reminds them of Mason. Thank you to DC United for working together with Mason's Fund to make the kids happy. Thank you to all the players who came to the Mason Superstar Day at Children's National Medical Center. They came on their personal time to make this day pretty special. We would like to thank Jill Sorenson, Brett and Eric Shuster from Comcast Sportsnet for doing a positive story about players and Mateo's efforts to honor his brother. A very special thank you to Katherine Kennedy for pulling this together and to the staff at Children's for making this happen. Your donation is to CNMC, tax deductible and you will receive a receipt from Children's. We bring you the great news that, thanks to you all, the Mason Leach Superstar fund has raised over $10,000 to help kids at the Children's National Medical Center! Below you will find the goals of the Fund. Above are pictures from the first Superstar Day, which was this morning. Unfortunately, we can't put pictures of patients due to privacy issues. These days will be held once a month. We gave out ice cream, generously donated by Edy's Ice Cream (flavors selected by Mateo), inspirational rubber bracelets, and donated items from DC United. Over 50 patients took part. We also gave out two awards, Target gift cards, to 2 Superstar Staff members. Based on Mateo's recommendation, we purchased over $500 worth of Target gift cards to give to patients when they need a pick-me-up, or to celebrate a special milestone. Mason loved to go to Target and that was the first thing Mateo suggested when we were talking about getting things for patients. Thank you to Katie Ahrens, the Volunteer Services office, and the staff on Hem/Onc for helping us organize this activity. Mateo was really into this project and it was very special for us. 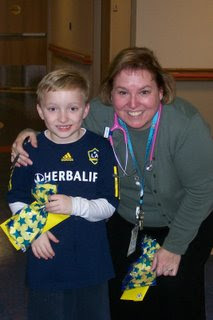 Mission: To encourage and empower patients to recognize their inner strength and feel like a “superstar”. Goal 1: To honor Mason’s life through “superstar” activities that will promote strength and hope for each child. Goal 2: To provide opportunities for children to have choices and control. Goal 3: To promote family activities both at the hospital and at home. Goal 4: To supply funds to provide extras for the Hematology Oncology Department patients that may arise throughout the year. Goal 5: To show appreciation to the staff that took excellent care of Mason and encourage excellence in family centered patient care. Goal 6: To encourage staff development and training about listening to the voice of children, especially younger children, and ways to empower them and increase their role in their own care. These funds go directly to benefit patients and no operational costs will be allocated to this fund. Every penny affects a child’s life. Stay tuned to hear about more activities and the fund. We plan on making this an ongoing program if we can. Thank you for honoring Mason's life. 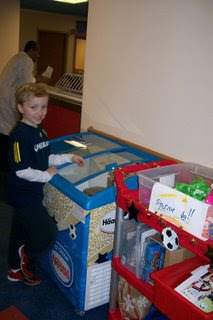 So many people have been generous in their contributions to the Superstar fund at the hospital. We are in the planning stages of what we will be doing with the money and have so many great ideas it is hard to choose! But we will post a report of what is happening with that fund by the end of the month. I am getting out the thank you's slowly but surely. You should get a letter from Children's Hospital as well. The Celebration of Life Fund has been great to do special things with Mateo. We will be going back to Ecuador on the 13th of Nov to go to two ceremonies for Mason at the Embassy to dedicate the Ambassador's residence park to Mason and Peace Corps. Mateo will be able to hang out with old friends and spend time with his good buddies to whom he did not get a chance to say goodbye last year. A good way to get closure for him. They are also planning some special things for him in Ecuador as well. Mason's Superstar Fund still open and doing great things! Dear friends: Thank you again for all your support. Your generous donations have given us a means to help us heal and keep his amazing spirit alive. The Mason Leach Superstar Fund was able to use over $15,000 for our activities this year. Help us keep the Fund going and enable us to keep Mason's spirit alive everyday in the lives of the children and staff at CNMC. Our Goal is to raise over $20,000 for 2008-2009. Every dollar counts. Thanks.